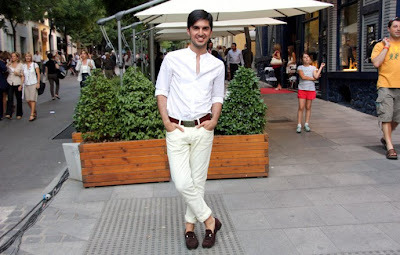 Editor of GQ España Jose Luiz here wearing Jean Paul Gaultier belt; Zara jeans and Prada shoes. Summer time, all white great. Carrie says '' you wearing white '' and here Stanford answers '' yeah like a virgin''. OK ! just a joke. By the way, don't forget the panths, legs are rolled. But here it is, a great combination of brown & white! A good taste.